Paris, 1798. Hortense de Beauharnais is engrossed in her studies at a boarding school for aristocratic girls, most of whom suffered tragic losses during the tumultuous days of the French Revolution. She loves to play and compose music, read and paint, and daydream about Christophe, her brother’s dashing fellow officer. But Hortense is not an ordinary girl. Her beautiful, charming mother Josephine has married Napoleon Bonaparte, soon to become the most powerful man in France, but viewed by Hortense as a coarse, unworthy successor to her elegant father, who was guillotined during the Terror. Inspired by Hortense’s real-life autobiography with charming glimpses of teen life long ago, this is the story of a girl chosen by fate to play a role she didn’t choose (summery from Goodreads). So I think what was hard about this book was the genre and time setting. I haven’t read a lot of historical fiction YA novels that I love. Let’s be honest, history isn’t really all that appealing to the mass readers of YA so you kind of have to be light on the history part. For readers like me who love history, this book barely scratched the surface of the French Revolution. Had this been an adult book, I would have expected it to be oozing historical details, but it’s not. It’s a young adult book so that means its a little on the lighter side of history and as an adult reader I can see the difference. It’s a nice introduction for younger readers and there is a focus on so I think the younger audiences will love it and adult readers will probably be in the ‘it’s good but not great’ camp. Sandra Gulland has written several other adult novels about Josephine Bonaparte which I have heard rave reviews about, so it sounds like expectations were high for this novel. I am not sure why she opted to write more of a YA novel with this one. Just because Hortense was younger doesn’t necessarily mean that her story needs to be written as a YA novel. Hortense herself was a little hard for me to take. She came across is way too selfish and it was a little off putting for me. It wasn’t awful, but for me it just wasn’t what I was expecting. I understood that she was in this privileged lifestyle but for me as the main character I hoped that she would have been a little less self serving. The good thing about YA novels is they are usually pretty easy to read so I was able to read this one in a couple of days. It was ok, it wasn’t great. The characters fell short for me and I just wasn’t fully into the story because I felt like there was so much history that could have come alive in this story but just didn’t and I am not sure why that was so untapped. If you are looking for a light read with a little history that you can get through relatively quickly, then you will probably like this book but for me I just felt like I needed more. I liked it enough to keep on reading but I wasn’t in love with it in the way that I had hoped. 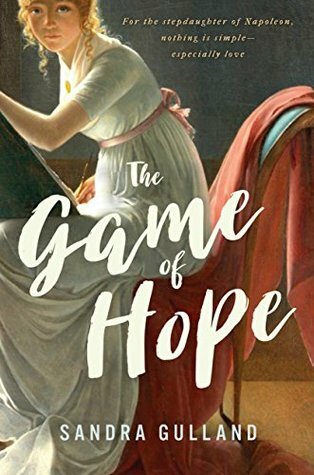 Thanks so much for hosting Sandra’s blog tour & for your review of The Game of Hope!